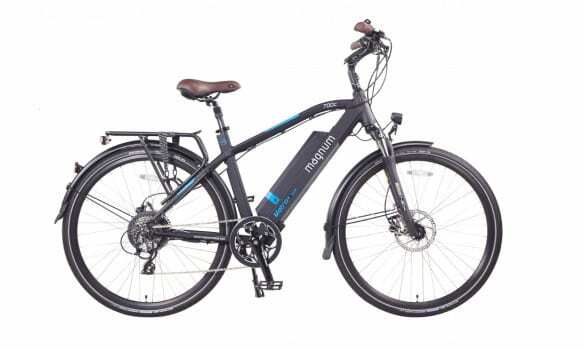 The Magnum Metro Plus is a great combination of style, speed and comfort. The Magnum Metro Plus is a great combination of style, speed and comfort. The adjustable handlebars allow for a comfortable upright riding style, while the sleek design allows means your ride will be fast and efficient. With hydraulic brakes, a large 624wh battery and Schwalbe Marathon 700C tyres, this bike offers excellent value for money in the commuter segment. It is available in black only and in one size, which generally suits people 175cm or taller. It has all the same parts as the popular Magnum Metro with the exception of the tyres. However, the geometry is very different, with larger wheels, narrower tyres and bigger frame. Electricbikesnz, aka Electric Bazza gave the Magnum Metro Plus a rave review here. Battery 624wh Samsung li-on frame integrated. Extras Carrier rack, lights, mudguards included.